Hmm, what happened to this? There was a still of a certain character that was labeled as being from "We'll Always Have Bourbon Street," and yet that character was most emphatically not in that episode. So, putting this behind the cut in case someone knows what episode it is from which would make it a spoiler, what do you guys think? 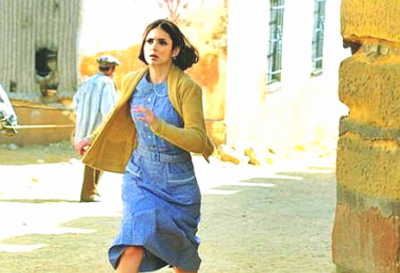 It's a shot of presumably Katherine considering the hairstyle and outfit. This was on tumblr since a little after the 408 stills were released but, to my knowledge, no one found a legitimate source for it. Additionally, the quality isn't exactly of the same quality that the stills are typically released in and while it does look flashback-y, the clothing doesn't look very Katherine-esque, does it? Someone said on a forum I visit that this pic was a manip. Yeah, sounds like it's a manip. Uh huh. Oh lordy, TVD and Homeland? BWAH! This makes me sad! Photoshop or not....I just need more Katherine in my life. Yeah, once you said that, I looked, and uhm, yeah. Apparently it's pretty known as a manip now. It's probably a manip, but I think it's also possible that she was meant to make a brief appearance (just like in one of 3x03 flashback scenes) that they cut due to time constraints, maybe? Apparently it's pretty known as a manip now, and yeah, her head isn't quite sitting on her neck probably. Plus, that setting doesn't fit anything else we saw in this episode. So yeah, manip. Unrelated to this post beyond the TVDness: I live in Orlando and the TVD convention was this past weekend. I couldn't go (due to funding issues), but a friend did - not only did she *go*, but she actually won an auction for a semi-private meet and greet with Ian! Only 10 people + Ian! Wow, fun for her, and I'm jealous with you!!!!!!!!!!!!!!!!!!! !